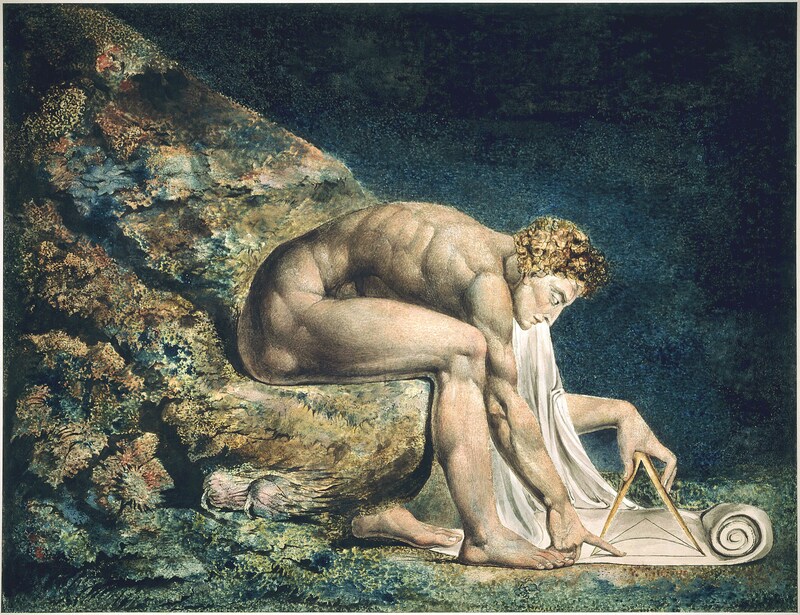 Recent conservation treatment at the Tate Gallery has revealed that the Gallery’s large color print of “Newton,” signed and dated by Blake in his own hand “1795 WB inv [in monogram]”, is watermarked “JWhatman/1804”.1↤ 1 Martin Butlin, The Paintings and Drawings of William Blake, 1981, I, 166-67 no. 306, repr. II, pl. 394 in color. All the large color prints, together with related drawings, are catalogued in Butlin, I, 156-77, introd. and nos. 289-329, and repr. in vol. II. The watermark, in the margin of the actual design, was only found when the fine canvas on which the print had been mounted was removed.2↤ 2 I am indebted to Kasia Szeleynski of the Tate Gallery’s conservation department for informing me of this discovery and discussing it with me. An inscription on the back of the print, previously covered by the canvas, reads “No. 22 Page 203”; this refers to William Rossetti’s listing in the 1863 edition of Gilchrist’s Life of William Blake, which means that the paper must have been mounted on the canvas after that date. Eight of the other large color prints in the Tate Gallery, also from the collection of Thomas Butts, were similarly mounted on canvas though “Pity” was lifted from its canvas preparatory to being lent to an exhibition in 1980.3↤ 3 Butlin 310; exh. The Painterly Print, Metropolitan Museum, New York, and Museum of Fine Arts, Boston, October 1980-March 1981 (17, repr.). The exhibition also included the small color-printed try-out in the British Museum (Butlin 313; 16, repr.) and the version in the Metropolitan Museum (Butlin 311; 18, repr. in color); the version in the Yale Center (Butlin 312) was repr. as fig. 50. It is expected that others will be similarly treated in due course, when further watermarks may be discovered; “Hecate” is already known to be watermarked “1794/JWhatman” but was not dated by Blake. The first documentary record of any of the twelve designs is the inclusion of eight in an account between Blake and Thomas Butts of 3 March 1806, apparently as having been delivered, four at a time, on 5 July and 7 September 1805; “Newton” was apparently delivered on the latter date. All the works delivered in 1805 are in fact dated “1795”, with the possible exception of the copy of “Christ Appearing to the Apostles” now in the Yale University Art Gallery, the only print from these eight not in the Tate Gallery. Nine prints from the Butts collection (seven of those listed in the account, including “Newton,” together with two titles not listed in any account) were sold by Butts’s grandson, Captain F. J. Butts, to W. Graham Robertson in 1905 or 1906 and were presented by him to the Tate Gallery in 1939. A number of cases of what may be called conceptual, mythical or even wishful pre-datings by Blake are already known. There are several examples of the later state of an engraving bearing the date of the first state.4↤ 4 For example, “Joseph of Arimathea among the Rocks of Albion,” “Albion Rose,” “Job” and “Ezekiel”; see Robert N. Essick, William Blake, Printmaker, 1980, pp. 29, 64-67, 70, 178-86, 257. It is also highly likely that the version of “The Penance of Jane Shore” that Blake claimed in the catalogue of his exhibition in 1809 had been “done above Thirty Years ago” was not the small, immature example from his series of watercolors of subjects from English history now in a British private collection—that version is easily reconcilable with a date of c. 1779—but the larger, more finished and more accomplished version in the Tate Gallery that seems to date from about 1793.5↤ 5 See Butlin, I, 23-24 nos. 67 and 69. But what, in the case of this print of “Newton,” is the original to which the date “1795” applies? Many people, including myself, have supposed that Blake printed more than one example of each color print at one time, by a sort of monotype process, finishing each print in pen and watercolor on demand at a later date.6↤ 6 The fullest discussion of the technique of the large color prints is in Essick, pp. 125-35. This would mean that the two known versions of “Newton,” like the (up to three) known versions of the other prints in the series, begin page 102 | ↑ back to top would both have been printed in 1795 and that this copy of “Newton” would have been finished in 1805 for delivery to Thomas Butts; this would of course have been reconcilable with a date, for the finishing only, of 1804 or later. But in no way can the first printing have been done in 1795 on paper watermarked 1804. It is known that paper manufacturers occasionally post-dated their watermarks by a year or so; a watercolor by Joshua Cristall in the Tate Gallery, on paper watermarked 1808, is signed and dated “J. Cristall 1807”, apparently when the work was executed, in a space carefully left uncolored.7↤ 7 See The Tate Gallery 1972-4, 1975, p. 52, repr., where the contrary is argued. But for a manufacturer to post-date his paper by as much as nine years is inconceivable, and in fact the previous batch of Whatman paper was dated 1794, only a year before the date given by Blake with his signature.8↤ 8 See the tables of watermarks in Butlin, I, 627, and G. E. Bentley, Jr., Blake Books, 1977, p. 72; until the discovery of the watermark on the Tate Gallery’s “Newton” no “JWhatman/1804” watermarks were known on any of the works included in my catalogue. For Whatman paper see also Essick, p. 105. The Butts prints are not only the first series for which there is any evidence; they also seem to have been the first set to have been sold to a patron. Blake offered another set of twelve prints to Dawson Turner in a letter of 9 June 1818 but these, and other examples, seem to have remained unsold at his death. One possibility could be that Blake printed one set in 1795 but that when he came to do the set for Butts he chose not to finish his existing prints but to start again from the beginning with new impressions. Frederick Tatham, who was not born until 1805, stated that Blake re-painted “his outline on the millboard when he wanted to take another print.” But to re-do the color printing after a period of nine years, with the original thick, gummy colors all dried up on whatever form of plate Blake used, whether millboard (Tatham stated that Blake used “a common thick millboard”) or metal, would seem to be a very perverse way of setting about things. If in fact the prints were color printed from metal plates it is possible that an outline was etched onto the plate in 1795 but that nothing else was done at that date. This is supported by the appearance of “God Judging Adam” in which Blake seems first to have printed a monochrome outline before overprinting it with his usual tacky color-printing medium. Or, in view of the fact that there are certain preliminary drawings, including one for the “Newton,” and even a small-scale preliminary color print of “Pity,” perhaps it is to these that Blake’s 1795 date applies, meaning that at least he had the idea and had made the first experiments in that year. Or, he may have actually begun printing the series of twelve designs in 1795 with the whole scheme in his mind but not completed it until he was able to sell a series to Butts in 1805. It is significant that three of the titles owned by Butts but not included in the 1805 accounts, “Satan Exulting over Eve,” “Pity” and “Hecate,” were signed in a different way from the others, with the single word “Blake” actually incised into the pigments. The 1794 watermark of “Hecate” allows for this work to have been executed in 1795, while “Pity” does not have a watermark; it is difficult however to be certain about the copy of “Satan Exulting over Eve” now in the collection of John Craxton, though no watermark is visible from the front of the work.9↤ 9 For a discussion of possible implications of the way in which the color prints are signed, though not in fact of the group with the incised “Blake,” see my article “Cataloguing William Blake” in Robert N. Essick and Donald Pearce, eds., Blake in his Time, 1978, pp. 84-85. Further explanations are no doubt possible. “Newton,” color print finished in pen and watercolor, 46 × 60 cm. Tate Gallery, London. Whatever the exact solution, both as to the techniques used by Blake and the stages in which he applied each process, there are far wider implications in this new discovery. It has been generally assumed, at least recently, that Blake’s use of color printing was confined largely to the years 1794, 1795 and 1796.10↤ 10 See Essick, pp. 147-51. This is based partly on the evidence of the large color prints but also on that of the illuminated books and the designs from them that were issued separately in color-printed versions. But it is now clear that Blake was still using color printing in at least one print executed as late as 1804-05. This also has implications for the theory that a revolution in Blake’s style took place as a result of his experiences during his stay at Felpham from 1800 to 1803, in which he came to concentrate far more on clear outlines and balanced forms than in his earlier works. It is one thing to postulate a color print basically executed in 1795 and then more closely defined with pen outlines and clear color washes on being sold to Thomas Butts in 1805; it is quite another to see Blake re-using, as late as 1804-05, a technique the most dominant feature of which was its blotting and blurring.